Residents of Porterville, California, breathe some of the most polluted air in America—but many have little choice, if they want to pay the bills. Now, thanks to an upstart Canadian success story, the people of Porterville can get to work on making their air cleaner. Some can even do it on their way to work. GreenPower Motor Company broke ground in June on a new manufacturing plant in Porterville. The company, headquartered in Vancouver, will supply the U.S. city with 10 locally-built, zero-emission transit buses within the next year. GreenPower’s expansion will likely create roughly 75 jobs right away, growing the company’s current workforce eightfold. And more job creation is on the horizon: in the next 10 years, analysis suggests, the Porterville plant has potential to generate some 576 direct and indirect jobs. No one would mistake the San Joaquin Valley—part of America’s “Salad Bowl”—for nearby Silicon Valley. The topography surrounding Porterville traps noxious fumes, and the economy in this historical agricultural region lags far behind the rest of the state. Last year the World Health Organization listed air quality in the valley as the worst in the United States—but as the Guardian reports, the poverty may be even more oppressive. More than 1000 jobs left the region in the past 20 years, the Porterville Recorder estimates. A poll on the Recorder’s website asks if readers feel the local economy is improving. Those voting yes are most likely doing so thanks to GreenPower’s arrival in town. California has long led on clean energy, largely to combat the state’s historically poor air quality. Their cap-and-trade program provides funding for projects that contribute to reaching the state’s climate goals while helping disadvantaged communities like Porterville. In this case, it’s an innovative Canadian company that’s capitalizing on the program, called California Climate Investments, to supply Porterville with enough electric buses to transform its transit fleet—and provide much-needed work. 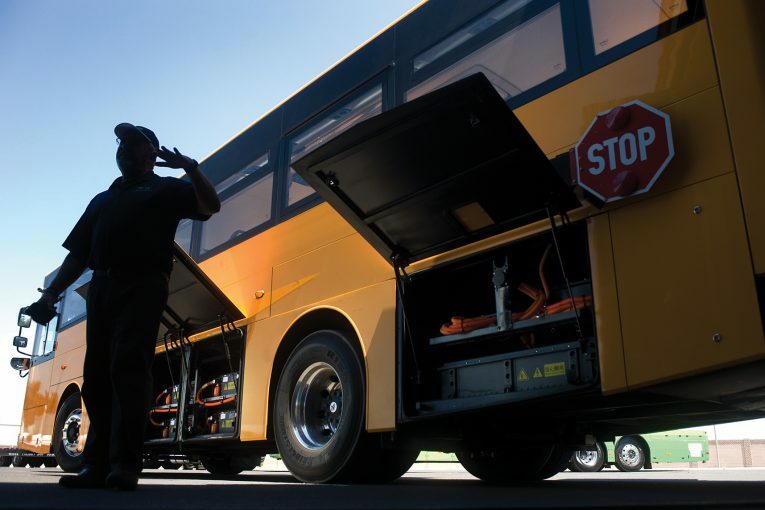 If they successfully secure contracts available from local school districts, GreenPower’s electric school buses could soon take Porterville children to their classes, too. For Canadians wanting a look under the hood, there’s no need to cross the border. A Victoria, B.C., tour company has a GreenPower double-decker in its fleet, and a second is touring California. They’re the first purpose-built zero-emission double-deckers in the world. Porterville’s initial 10-bus order isn’t just big news for the city, it’s big news for GreenPower, too. As its first buses take trial runs on California roads, the Canadian underdog is taking on Proterra—the American market-leader in zero-emission transit buses—in their competitor’s own backyard. To Malcolm Clay, an investor and board member with GreenPower, the company’s success comes in part because it’s offering a practical and timely solution to a widespread problem. Next : As China headlines the energy transition, will Canada be backstage or out in the crowd?